Last week, we celebrated the grand opening of Sullivan Playground at University of Minnesota Amplatz Children’s Hospital. 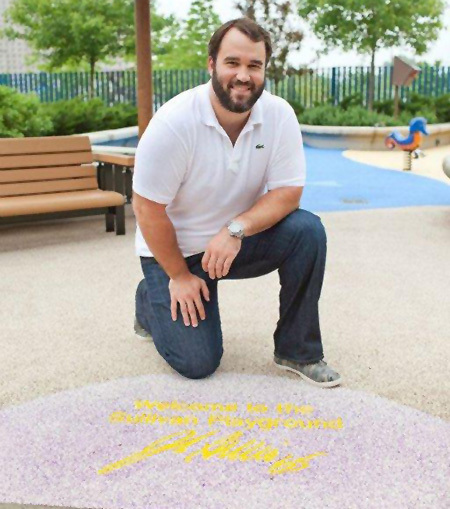 The playground is named for Minnesota Vikings Center John Sullivan, who pledged $150,000 to create the play space. Vikings teammate Chad Greenway, through his Lead the Way Foundation, and the Minnesota Vikings football organization also committed $25,000 each to bring the project to fruition. Sullivan Playground is a safe and accessible playground for patients and their siblings to play while they’re visiting the hospital. 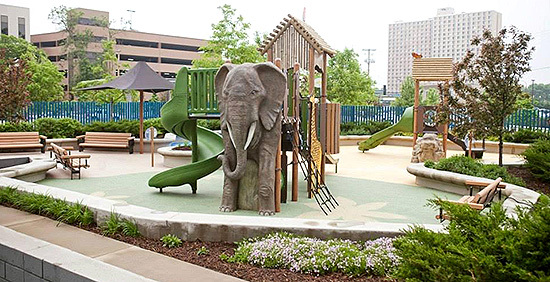 The playground features a large concrete elephant, a concrete manta ray bench, a Permalene® giraffe panel, nature-inspired roofs and PebbleFlex® safety surfacing with custom graphics including John’s signature. Even more than the unique visual aspects, the playground’s design features take into account the patients who will use the equipment. The Rollerslide was customized to accommodate children with IVs. Because some children at Amplatz must be hooked up to IVs constantly, the playground features a custom Rollerslide that allows kids to climb up and slide down without getting tangled in the equipment. This is the first commercial outdoor slide ever made to accommodate children with IVs. Swaying benches provide a place for parents and children to relax and take in the fresh air. A climbing net gives patients’ siblings a place to blow off steam while they develop their large motor skills. A Talk Tube located in the elephant’s trunk allows kids on the ground to communicate with friends on the structure’s upper deck. A shade structure provides protection for kids whose treatments make them sensitive to the sun. Children using walkers or wheelchairs can navigate the playground with ease on this cushioned, porous surface. 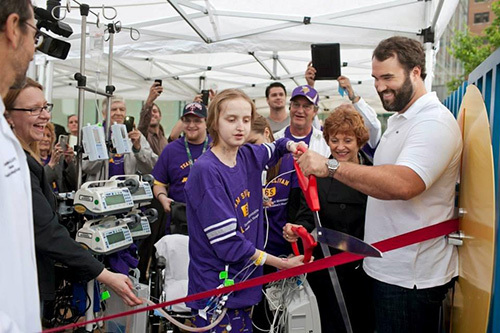 The grand opening celebration included a ribbon-cutting ceremony featuring a special patient and his family. Immediately following the ceremony patients and families were able to test out the new playground. 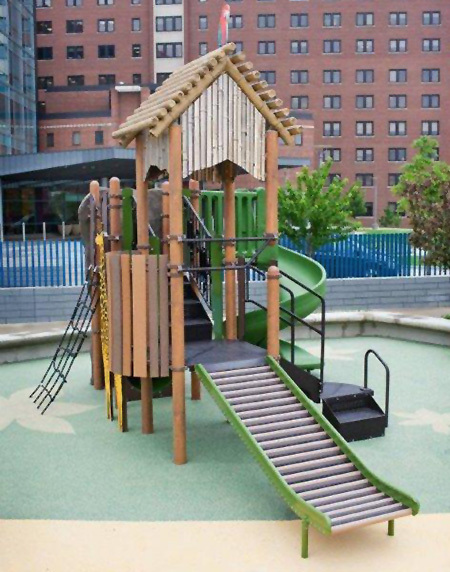 This entry was posted in Accessibility, Healthy kids, Inclusive playgrounds, playgrounds, Sensory playground and tagged Amplatz Children's Hospital, John Sullivan, University of Minnesota, Vikings by PlayLSI. Bookmark the permalink.